I don’t know anyone who has seen a Bald Eagle who doesn’t agree that this is one mighty cool bird. We all know that the Bald Eagle is the national emblem but to see one in person is to know why. I imagine, no bird lover is entirely happy until they’ve seen a Bald Eagle in the great outdoors. Same for photographers who find birds a captivating subject. Birders and bird photographers are willing to travel as far as necessary to fulfill their need. Close to my home in the San Francisco Bay Area, I have seen Bald Eagles at Crystal Springs Reservoir and Calaveras Reservoir. However, a pair of binoculars or a spotting scope was needed to get a really good look. 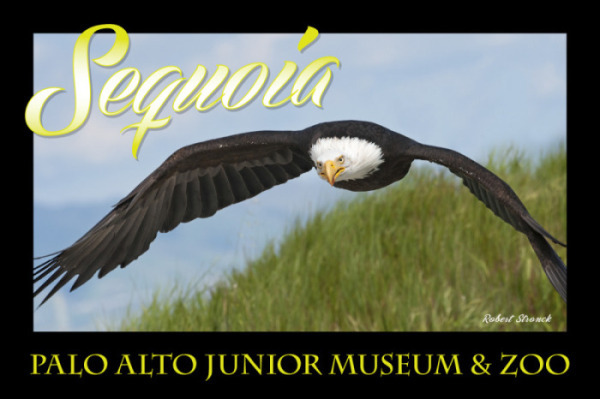 But that all changed recently when I had the pleasure to see and photograph “Sequoia,” a captive Bald Eagle from Palo Alto’s Junior Museum and Zoo. Sequoia, who will turn 25 this year, has led an interesting life. In 1988, she was one of a dozen eaglets that were relocated from British Columbia to Big Sur as part of an effort to re-establish eagles in California. After being fitted with a radio transmitter, she was released latter that year. Researchers tracked her to the Bay Area where she stayed for a number of days before continuing northward. Unfortunately about two months later, Sequoia was found by a rancher in Humbolt County –she was emaciated, dehydrated and suffering from a small caliber gunshot wound. After being treated for her injuries, including a permanently paralyzed tail, Sequoia was determined to be non-releasable. She was subsequently accepted at the San Francisco Zoo as an “ambassador” for bald eagle reintroduction efforts. And it’s worth noting that those efforts have helped bald eagle populations rebound in California and across the lower 48 states. Sequoia’s transfer to JMZ has allowed the trainers greater flexibility in her exercise activity. For several months now, she has been a regular visitor to Byxbee Park at Palo Alto Baylands. At Byxbee, Sequoia is allowed to fly freely. And what a sight she is. High in the sky, bald eagles appear huge. Now imagine, Sequoia with a wingspan of approximately 6 1/2 feet and weighing about 11 lbs. flying fast and low –seemingly within arm’s reach. What a rush! And Sequoia seems to enjoy her flight time too. Typically, she flies from the heavily gloved arm of one handler across the rolling hillside to another trainer where she receives a meal of quail, fish, and mice. Sequoia is an intelligent animal with a mind of her own, and occasionally diverts from the regular exercise plan. In fact, she made national news just this February when she went “AWOL” after being spooked by high winds during a free flight session. For 3 days she was on the lam. Her trainers tracked her with the aid of the radio transmitter she wears and located her perched high in a tall tree in nearby Redwood City. Eventually, when she was hungry enough, the lure of tasty food treats offered by the trainer helped her in overcoming a fear of descending into an unfamiliar area. While allowing Sequoia to fly freely involves a certain degree of risk, the handlers feel that the benefit to the bird’s health and well-being as well as the benefit to the public is important. Sequoia has resumed her routine of daily exercise now. If you want to see this magnificent bird, she is usually out around 4pm on weekdays and 2pm on weekends. It shouldn’t be too difficult to spot her. To view my photographs of Sequoia click here for lightbox gallery.